The seventh volume in this award-winning graphic novel series features ten mystery comics and two never-before-published short stories by former OWL Magazine editor, Craig Battle. Each solve-it-yourself story stars amateur detective Max Finder and his best friend, aspiring journa... read full description below. 1 April 2013 by Owlkids Books Inc. 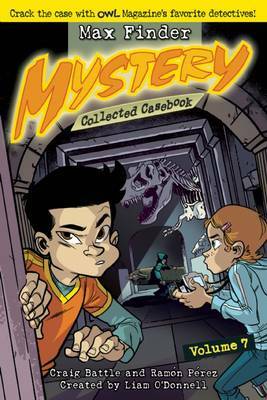 The seventh volume in this award-winning graphic novel series features ten mystery comics and two never-before-published short stories by former OWL Magazine editor, Craig Battle. 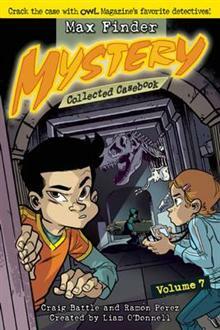 Each solve-it-yourself story stars amateur detective Max Finder and his best friend, aspiring journalist Alison Santos. Seventh graders at Central Meadows Junior High, these two intrepid investigators must call upon their reason, memory, critical thinking, and observation skills to crack each case before them. Who stole the school mascot? Why did someone trash Ursula's guitar amp? And who sabotaged the girls' relay team? Readers can decipher the clues for themselves and draw their own conclusions -- before the true culprit is revealed. Bonus content unique to this volume includes a social media style introduction to all the recurring characters as well as kid-friendly forensics techniques outlined by Max and Alison's forensics expert sidekick, Zoe Palgrave. Craig Battle was the editor of OWL magazine from 2006 to 2012. He now works as an editor at Sportsnet magazine. He has worked as a reporter, camp counselor, and basketball coach, and now adds children's author to his resume. Originally from Lantzville, BC, he lives in Toronto. Ramon Perez has illustrated for Marvel, DC Comics, and OWL magazine. He lives in Toronto. Liam O'Donnell is an award-winning author and elementary school teacher. He lives in Toronto.